Over the holidays, I enjoyed a couple of weeks off, and during that time I set a few goals for myself. I wanted to start the new year off on the right foot, and getting myself organized was far overdue. My goals were: (1) Clean up my email inbox; (2) File away all of my recipe clippings from magazines; and (3) Organize my side of the office. I’m happy to report that, as of last week, I managed check everything off of my list. When I set out to make this recipe, I realized that I hadn’t ever made a basic chocolate cheesecake. Totally unfortunate, right?! They’re so good! I ended up adapting an Epicurious recipe for the chocolate cheesecake, and then finished it off with a homemade cherry pie filling topping. Since cherries aren’t in season here right now, I used frozen cherries, but you could certainly use fresh if you have them available to you. To say that this cheesecake was phenomenal would be an enormous understatement. I am 100% partial to cheesecakes with an Oreo crust, pretty much no matter what the cheesecake flavor is. 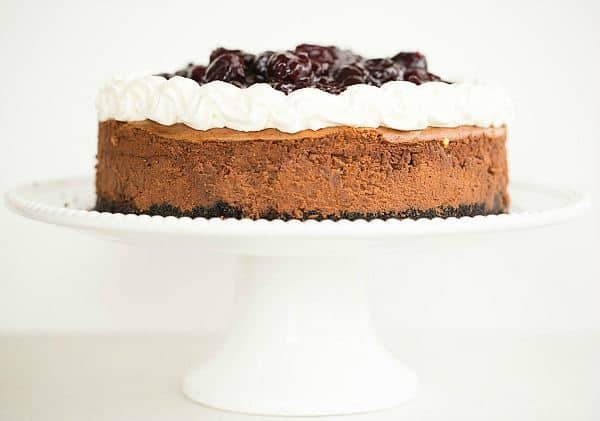 Add to that a very tall chocolate cheesecake, a thick border of cream cheese-spiked whipped cream frosting, and then, of course, the cherries. Everyone who had this was absolutely enamored with it. This is rich, make no mistake, and it’s worth savoring every single bite. 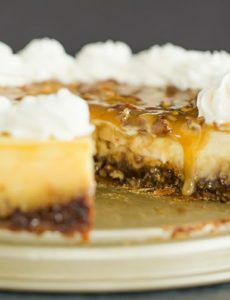 Grab a cup of coffee and be sure to linger over a piece of this cheesecake. This cheesecake should be a lesson to me to keep myself organized going forward! 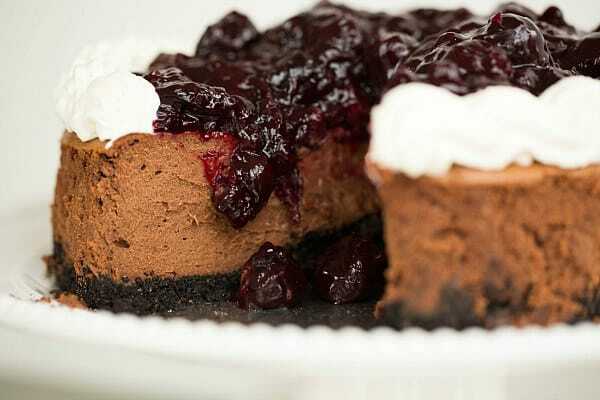 Creamy chocolate cheesecake on an Oreo crust, topped with sweetened whipped cream and homemade cherry pie filling. Preheat oven to 350 degrees F. Butter a 9-inch round springform pan; set aside. Make the Crust: Process the cookies and sugar in a food processor until ground into fine crumbs. Add the melted butter and pulse until the mixture is evenly moistened. (If you do not have a food processor, you can place the cookies in a zip-top bag and crush into crumbs with a rolling pin, then transfer to a bowl and stir in the sugar and melted butter.) Press the crumb mixture evenly into the bottom of the prepared pan. Bake until the crust is set, about 8 minutes. Set on a cooling rack while the filling is prepared. Make the Filling: Place the chopped chocolate in a metal bowl and set over a saucepan of barely simmering water. Heat, stirring occasionally, until the chocolate is completely melted and smooth. Remove bowl from the saucepan and allow chocolate to cool to room temperature. Meanwhile, using an electric mixer on medium speed, beat the cream cheese, sugar and cocoa powder together until light and fluffy, about 3 minutes, scraping down the sides of the bowl as needed. Add the eggs one at a time, beating well after each addition and scraping down the sides of the bowl before adding another. Add the cooled, melted chocolate and beat until just combined. Using a rubber spatula to give it a final mix (the batter will be on the thick side) and pour the filling over the crust, smoothing the top into an even layer. Bake until the center just barely wiggles when moved and the top looks dry, about 1 hour. Cool for 5 minutes, then run a thin knife between the cake and the sides of the pan to loosen. Transfer the cheesecake to the refrigerator and chill, uncovered, overnight. Make the Cherry Topping: Drain off ¼ cup of juice from the thawed cherries and set aside. In a medium saucepan, combine the cherries (and any remaining juice), sugar and salt over medium heat and cook, stirring occasionally, until it reaches a boil, about 5 to 10 minutes. In a small bowl, whisk together the reserved cherry juice and cornstarch, and add it to the cherry mixture. Stir constantly until thickened, about 1 minute. Remove from the heat and stir in the lemon juice. Allow the mixture to cool to room temperature, then transfer to an airtight container and chill until ready to use, at least 1 hour. Make the Whipped Cream: On medium speed, beat the cream cheese, sugar and vanilla extract in a mixer with the whisk attachment until smooth and completely combined, about 3 minutes. Slowly add the heavy cream, scrape the sides of the bowl, then increase speed to medium-high and whip until stiff peaks form. Finish the Cheesecake: When ready to serve, remove the sides of the springform pan and place the cheesecake on a serving platter. 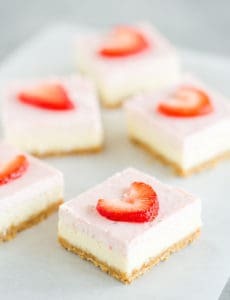 Using a pastry bag with a decorating tip, pipe a border of whipped cream around the top edge of the cheesecake. Spoon the cherry pie filling into the center. Garnish with chocolate shavings, if desired. 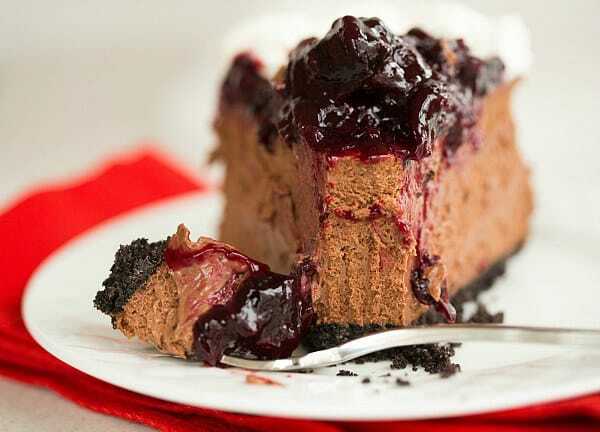 Leftover cheesecake can be stored, tightly wrapped, in the refrigerator for up to 5 days. Can I add kirsch to the filling, like 3-5 Tbsp? Would that impact the baking time/temperature and consistency? Hi Mika, Yes you could do that, no need to adjust the time or temperature! Hi! Do you transfer to the fridge after 5 minutes out of the oven or let it cool first? Hi Carolyn, I let it cool to room temperature first. Enjoy! Looks amazing! Would I be able to halve this recipe and use a pre-made Oreo pie pan? How would this affect baking time? Also, can I add kirsch to the cherry topping or would that ruin your recipe? Thank you – I look forward to making this! Hi Camille, That’s a great question and I honestly have no idea. I’m not sure how much batter would fit into the pie plate and how long it would need to bake. You could definitely add kirsch to the topping though! I made this for my husbands work but I used dark chocolate instead of bitter sweet & I used canned cherry pie filling. My husband said everyone loved it, too bad I didn’t get to try it. I love this site, thank you so much for sharing these recipes especially for people like me, a beginner baker! Can this be made ahead and frozen? If not, how many days ahead can it be made? Thank you! Hi Carolyn, Yes, you can freeze this (I would recommend freezing the cheesecake itself and topping and garnishing before serving). You could also make it up to 2 days ahead of time. Would you freeze in the Springform? Hi Carolyn, No, I would remove the sides once it’s been cooled and chilled, and then wrap in plastic wrap, then foil. If you have an extra large cake spatula, I would slide the cheesecake off of the bottom of the springform pan; otherwise, it’s fine to leave it. I just put my cheesecake in the oven!!! I’m so excited! I’m baking this for a girls night we are having Friday night! Thank you south for the recipe!!! Making this for the 2nd time. Thanksgiving dessert! Heading out in a few minutes to buy some Port to go with it. Mmmmmmmm……. Correction. The waybackmachine.com helped me out. Looks like the difference is as follows: 1lb frozen dark tart cherries – 1/4 cup kirsch, 1/4 cup sour cherry syrup – soak for 6 hours, drain for 2, shaking occasionally. Reserve all the liquid Then halve the cherries and add 6tb of reserved liquid to a frying pan and cook until the syrup thickens and add the cherries to thoroughly coat. There should be 10tb (it’s ok if it’s a little over) of the cherry liquid remaining. Add that liquid to the cheesecake while mixing. Otherwise it’s the same cheesecake. One of my favorites! This cheesecake was, in a word – sublime. I made it (with a few minor tweaks of my own) for an Oktoberfest party, and I have never seen a cheesecake disappear as quickly as this one did. Many thanks for a great recipe! I just made this. It is my first ever made from scratch cheesecake. I can’t wait to dig in! If I could I would post a picture of it! I’m making this cheesecake right now and I must tell you that I’m absolutely thrilled by those photos. It looks A-MAZE-ING! Anyway, I don’t know that I did wrong, the cheesecake looked really high in the oven really gorgeous and fluffy. But when I took the cheesecake out of the oven it kinda shrinked and started to wrinkle. It also happened when I tried to do one of your other cheesecakes. Could you tell me what did I do wrong? Thanks. I’m not sure that you’ve done anything wrong; cheesecakes tend to shrink away from the sides of the pan as they cool naturally. I made this for my birthday last week and everyone loved it ^_^. The top cracked but after adding the cherry topping and whipped cream you couldn’t tell. I failed at making the whipped cream so I ended up using store bought. Hi Rahul, I have never tried this substitution in a cheesecake, so I couldn’t say what the resulting texture would be like. It sounds like you’d need to make some type of chewy cookie or cake base if you want it soft. 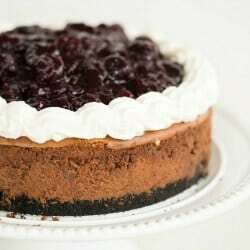 Do you use a water bath when cooking the cheesecake? I’ve heard the argument for or against and I’m not sure which way to go on my first attempt. What do you think about using sour cherries? Of course I would increase the sugar. Hi Pam, Sure, if you prefer those! Made this cheesecake this weekend. Was so good and received a lot of praise for it, both in looks and taste :)! A bit too chocolaty for my taste, but I think I used too bittersweet chocolate. What cocoa percentage did you use for the chocolate? Hi Kristine, I’m so happy you enjoyed it! My bittersweet chocolate is 72%, but I think you could go as low as 60%. I hope that helps! This looks like an awesome recipe! I’m still relatively new to the baking scene, so I apologize if this is a silly question. I’m planning on making this for a dinner on Sunday. My question deals with the whipped cream. Does the addition of cream cheese help stabilize the whipped cream? And is it still light and airy like regular whipped cream? The plan is to eat at 6:00, so I was wondering what time would be best to make and pipe the whipped cream on the cake. Thanks for your help! Again, this recipe looks incredible. Hi Andy, The cream cheese does stabilize the whipped cream. You could pipe the whipped cream at any point earlier in the day and refrigerate the cheesecake until you’re ready to serve. Enjoy! 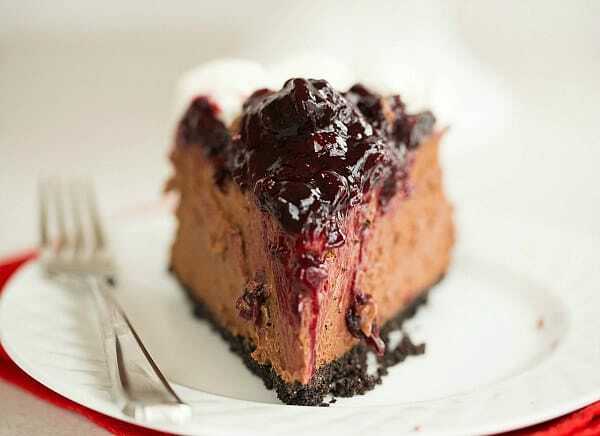 What a delicious and decadently rich cheesecake! My household loves cheesecake and I have made various over the years. This was a favorite…and in a house where they eat multiple servings, ate one and said it was satisfying enough and rich enough that one serving was just fine. (and then hunted down more later). I made two of them yesterday, Valentine’s Day, for my Valentine son’s birthday cake. He’s a chef. He was impressed. 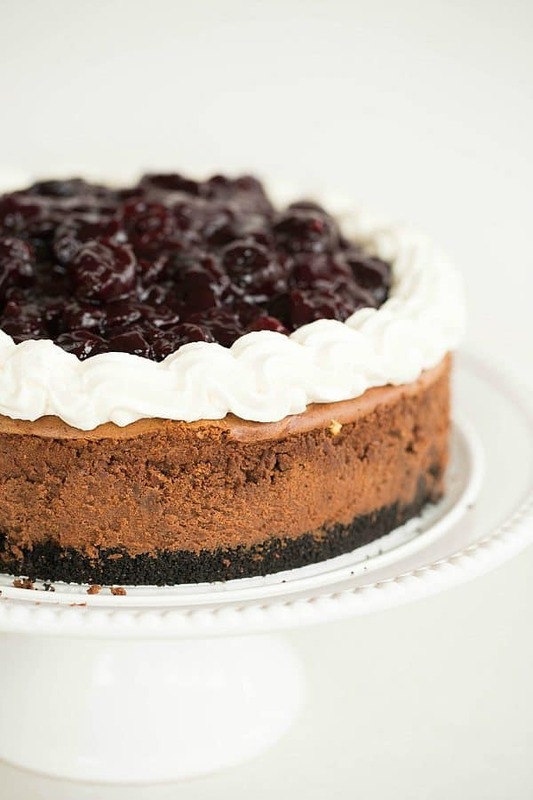 Thanks for the great new cheesecake to add to my recipe files…it’s a keeper! Thank you Michelle for this amazing recipe. 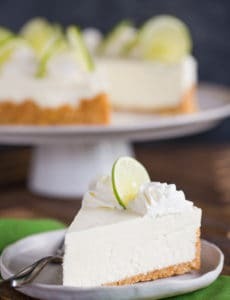 I adore all your cheesecake recipes! Hi Ala’a, I think that would work just fine. I can’t remember how long I thawed the cherries, maybe 30 minutes or so? Enjoy! Is it required to leave it chill overnight? If not what would you require be the longest time? Hi Ash, It really is best if you can chill it overnight. If you can’t, I would do at least 4 to 6 hours. Hi. I make homemade oreo cookies and I was wondering if I make this in mini/single serving form (in a cupcake liner) would I cook the cookie first and then cook the cheesecake on it( I planned on cooking the cookie in the cupcake liner)? Or can I put the cookie dough on the bottom and place the cheesecake on top and cook it all at once. Hi Shawna, I don’t think you would need to pre-bake the cookie crust. I would just press them into the bottom (use the bottom of a shot glass to make sure it’s nice and compact), then put the cheesecake filling on top and bake. I actually baked my cookie in the cupcake paper first, let it cool and then added the cheesecake filling and baked the cheesecake. It worked out wonderfully! Very tasty! I couldn’t find bittersweet chocolate, (time crunch) but used semi-sweet and dutch cocoa instead of cocoa in the cheesecake. Very awesome cheesecake! Thanks for the recipe. I absolutely love your blog! I swear I’m on here everyday to see what new things you’ve posted. I made this cheesecake tonight (with a few minor changes) and I’m going to have to take it to work in the morning so I don’t eat the whole thing! So good!! This was the most amazing cheesecake I’ve ever made! I couldn’t find frozen cherries and fresh are out of season so I substituted with a bag of mixed frozen cherries/blueberries/raspberries. And I just made regular whipped cream. It was decadent and delicious!! I’m glad you went through your recipe clippings! This looks phenomenal. This looks chocolaty and rich, the kind of deserts I love!